When you look at any text dealing with the armies of the eighteenth and nineteenth centuries one of the features which immediately stands out is the elaborate uniforms worn by the armies of every combating nation. My particular interest is in the Napoleonic period and the armies of that era excelled themselves in the splendour of their attire. Contemporary observers regarded the French uniforms with unreserved astonishment. The luxury of the French uniforms was overwhelming and veterans of the period, writing their memoirs in their old age, mourned the passage of such magnificence. They consoled themselves with the conviction that no greater military splendour, bound up as it was with the charisma of their Emperor, had ever been seen in Europe, or would ever be seen again. But how did such colour and vibrancy come into common usage among the army rank and file? Prior to the age of gunpowder, recognition on the battlefield of friendly versus unfriendly units could be achieved by a display of badges and flags – hence, men-at-arms sporting the heraldic emblems of their feudal lords on their shields and massing under the banner of their captain. However, in the late sixteenth century and into the seventeenth century a revolution swept the battlefield. With the advent of reliable gunpowder-charged muskets and the musket fire from massed formations becoming the decisive factor on the battlefield this led to the crystallization of military organization into professional armies consisting of trained soldiers arranged in permanent organizations. Gunpowder also meant that as soon as the first volley was fired, the battlefield would be shrouded in thick smoke. At this time, units were still raised by wealthy individuals much as they had been in feudal times but two factors led to the donning of standardised military uniform. As unit sizes grew the interests of economy and the building of an esprit de corps led commanders to the provision of uniformity of clothing within their units. Also, large units all wearing the same bright colour helped in identification when the battlefield was choked with smoke. The Hierarchical Principle – essentially the differentiation of rank within an organisation and the differentiation of types of units both in terms of branches of the army and within a smaller unit – e.g. the designation of elite troops such as grenadiers. The Seduction Principle – the innate desire for soldiers and their commanders to want to look smart and attractive – as Jane Austen commented in Pride and Prejudice regarding Mr Wickham “the young man wanted only regimentals to make him completely charming”. This goes hand in hand with the idea of parades – the grandeur of the parade is in no small part due to the splendour of the appearance of the units taking part. The Utility Principle – compromises made on campaign for the practicalities of warfare – e.g. the wearing of plain greatcoats in bad weather and the stowing of gaudy badges that might draw enemy fire. On top of this there was a tendency for all armies to copy the appearance of particular units that were deemed the “best” – hence, hussars in almost every army copied the appearance of the original Hungarian hussars drafted into the Austrian Army in the eighteenth century. 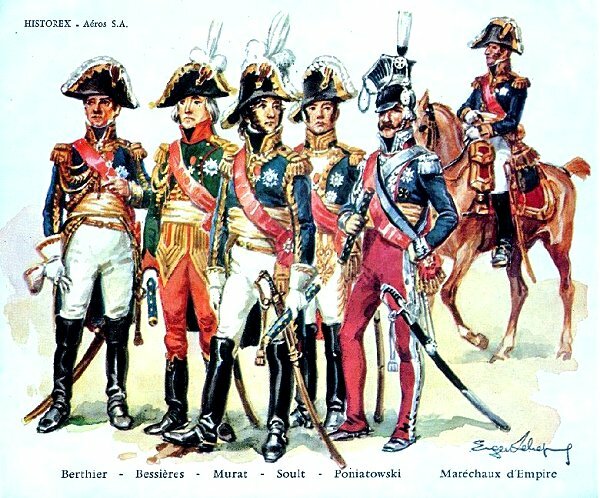 The dolman and pelisse, festooned with lace, and the shako and sabretache became ubiquitous. But whatever the principle, the outcome on the battlefields of Europe was spectacular. 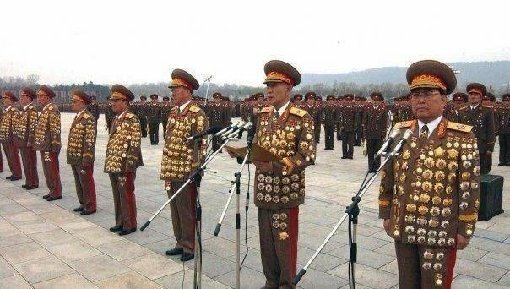 All that having been said, I’m not quite sure what principle still drives the uniforms of senior officers in the army of North Korea – perhaps there is a Pearly King and Queen principle I have overlooked.